What is your view on Eminem's best album created? Eminem has released hit throughout the years and has collaborated with many artist. Eminem has released ten studio albums, five compilation albums, and five video albums. His talent is one no-one talks down on. Eminem's third studio album, The Marshall Mathers LP, sold 1.76 million copies in its first week of distribution, breaking records for the fastest-selling hip hop album of all-time and the fastest-selling solo album in the United States during that time. The Marshall Mathers LP still ranks as one of the best album heard by The Wrap-Up Magazine when it come to Eminem. Although there are many other tracks and albums that caught our attention, this one still remains the most Favorited. 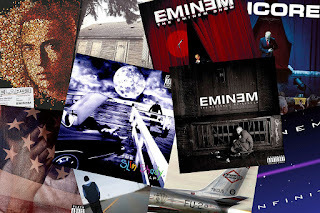 So whats your favorite album by Eminem? Honest opinion please! Whats Your Favorite Mariah Carey Album? What's Your Favorite Lil Wayne Album?